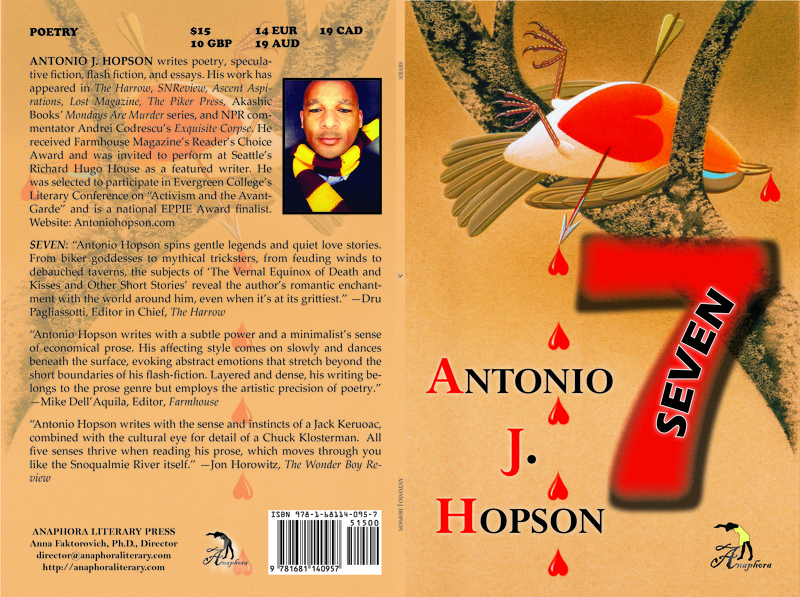 SEVEN: ($15, 6X9”, 60pp, Softcover ISBN: 978-1-68114-095-7, Hardcover ISBN: 978-1-68114-104-6; EBook ISBN: 978-1-68114-096-4, LCCN: 2015941134, May 2015; Purchase on Amazon or Barnes and Noble): It is said that throughout human history, there are only seven stories to tell: overcoming the monster, rags to riches, the quest, voyage and return, comedy, tragedy, and rebirth… A.J. Hopson is a lover. A gentleman. A pirate. A father of two boys and the ex-husband to a suicidal addict who survived breast cancer. Life is a journey, and part of the time he is on fire, or laughing, making love, drinking, or watching crows plot his destruction. Here’s all seven of his stories embedded into a single book of poetry. Global Warming: A Love Story: ($20, 142pp, 6X9”: Softcover ISBN-13: 978-1-68114-274-6; $35: Hardcover ISBN-13: 978-1-68114-275-3; $2.99: EBSCO EBook ISBN-13: 978-1-68114-276-0; LCCN: 2016941894; Release: July 1, 2016; Purchase on Amazon or Barnes & Noble): is a timeless love story, dressed up as treaties on climate change. A science teacher/aspiring writer, returns to school for professional development and falls head-over-heels for a “lithe and lovely” 20-year-old college student. Both are enrolled in a class that examines the nuances of global warming. They pass notes, flirt, and a relationship slowly evolves. But soon Julian, a hopeless romantic, discovers that Allison is due to marry her high school sweetheart. Julian risks all—including his job—to impress her, seduce her, and steal her away. During a final exam, he reads a treaty on the social economics of climate change. In this scene, between passages of political debate, are woven in a divine poem written centuries ago by Sappho. Allison is moved by his courtship and the real heartache begins. It has bikers, twisted fairytales, and a cynically sarcastic, Kerouac-loving friend who can cite passages with a cigarette hanging from his mouth and a beer in one hand. It has foreplay, after-play, easy to understand and interesting climate schematics, schoolchildren debating the philosophical underpinnings of Alice in Wonderland, rejection, respite, acceptance, and rejection again. This is a subtle metaphor symbolizing the intense relationship between Julian and Allison. A romance, at the surface, but look closer at this hybrid and you’ll find a deeply philosophical story addressing the fate of the planet and a workaholic-romantic who can’t help but break his own heart. Global Warming: A Love Story is a fast-paced romance that will make women swoon and men laugh. At the very least, it will give women a gritty behind the scene look at their would-be seducers. Nefarious: A Novel: (Softcover: $20, 258pp, 6X9”: ISBN: 978-1-68114-370-5; Hardcover: $35: ISBN-13: 978-1-68114-371-2; EBook: $2.99: ISBN-13: 978-1-68114-372-9; LCCN: 2017950753; Front Cover Design: Agnew Kyle; Adventure; Release: July 30, 2017; Purchase on Amazon or Barnes & Noble): Max Rigby is a middle-aged, aloof writer stuck in the past when he falls in love with the pit-girl from S/V Nefarious, a sailing vessel that lives up to its name. The woman who has awakened his heart is the fleet’s most fierce sailor, Robin Mac Bradaigh, aka “Mac”, a young, fiery, unapologetic sailor who refuses to be pushed around by a fleet of scoundrels. But Nefarious carries a dark reputation, and Max soon finds himself caught up in a sailing race that is as dangerous as it is thrilling. Unburdened by the necessities of polite society, the sailors aboard Nefarious are forced to defend their title during Race Week, a rowdy and rough competition in the Salish Sea. The devil himself has stakes in the race, and he must keep his skipper, Dan Swardstrom from distractions: the mysterious pregnancy of his fiancée, a hung-over crew that keeps blowing their starts, and a mutiny led by the pit-girl. During the race, the devil has been forced to live the life of a mortal and can only sail for Nefarious. He desires the Race Week trophy, centerpiece to a hedonistic party that requires animal sacrifice.